I am a HUGE fan of PHLUR fragrances. Why? Because they smell natural. They are in fact natural scents. PHLUR claims to use natural materials when making their scents and you can tell in the final product because their scents are definitely different. They are in fact more realistic than other scents are. 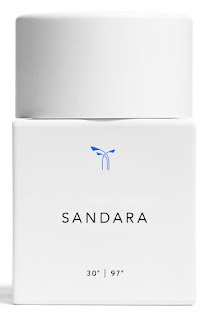 Today I want to introduce you to one of their newest scents called Sandara. It is an Eau de Parfum that comes in a 1.7 fl.oz./50mL bottle. Sandara is a light fresh fragrance that reminds one of nature and evokes a walk into the woods. It is calming and some say meditative. A spiritual journey inspired by a retreat into nature. It is about drawing power and energy from the healing elements of nature and reconnecting ourselves and resting from the constant chatter that goes on in our daily digital lives. It has notes of forest air, violet leaves, timur pepper, sandalwood and oak moss. Most of all, Sandara is a reflection of you. PHLUR fragrances are hypoallergenic, cruelty-free, vegan, sustainably sourced and packaged with recycled materials. They do not use parabens, phthalates, BHT, phenoxyethanol and nitro musks. All of their scents are as earth friendly as they can be. This scent would make a great gift for a woman who likes fresh scents or even a man who likes nice light scents. It is a unisex scent. It smells crisp and clean, not at all like anything I have smelled before. I like that it reminds me of nature and the forest. But not earthy and wet. I like the lightness of it, how clean and fresh it is. I could see a man wearing this as much as a woman. Definitely. It is definitely a unisex scent. PHLUR Sandara Eau de Parfum is available from www.phlur.com. Like PHLUR on Facebook:https://www.facebook.com/Phlur/; Follow PHLUR on Twitter:@phlurfragrance;Follow PHLUR on Pinterest:https://www.pinterest.com/phlur/ and Follow PHLUR on Instagram :https://www.instagram.com/phlur/.